TAIPEI (AFP) ― For decades, Lin Tsai-pan has tended his tea fields in the misty green hills of central Taiwan with a devotion bordering on obsession. It is not just a job. It is a passion and a question of honor. It is exactly 30 years since he first won a prize for his oolong leaves at a prestigious contest held by Luku Farmers’ Association in Nantou county, 20 years since his second prize, and 10 years since his third ― and so far last. “I feel I have a good chance of creating another miracle this time,” he said on the eve of the 2012 summer competition, which was held in May. The stakes are huge. The winner of the competition can expect to sell his product at a steep premium ― thousands of U.S. dollars per pound ― not least because of growing interest among newly affluent Chinese connoisseurs. The impact of Chinese demand was dramatically illustrated two years ago, when that year’s winner was able to sell his harvest of 12 kilograms at T$6.0 million ($200,670), twice the previous year’s price. “Some ‘nouveaux riches’ from China think it worthwhile spending hundreds of thousands of Taiwan dollars,” said Tony Lin, a senior staffer at the farmers association who recently returned from a fact-finding trip in the mainland. Tea is a science in Asia. The categories are measured in terms of the fermentation process, with fully fermented black tea at one end and green tea at the other. Oolong tea, in the middle of the two extremes, has emerged as a must-buy for a large number of the more than 1.8 million Chinese tourists who visit the island each year, following an abrupt thaw in relations. Taiwan got a late start with oolong. It was introduced in 1885 from southeast China’s Fujian province to Tungting, Chinese for “Hill Top,” a 700-meter mountain in Luku. But the island has caught up, and more than 120 years later, the oolong tea produced in Taiwan has outperformed oolong grown in the mainland. Oolong prices vary sharply, but medium-priced tea weighs in at about T$3,000 per kilogram. “Taiwan tea has a special flowery fragrance which China-produced tea doesn’t,” said Hsu Rung-chun, a third-generation merchant in the northern Lungtan township with deep knowledge of the trade. Taiwanese tea developers are working hard on different flavors. One example is “Oriental Beauty,” a tea with a complex aroma and a rich aftertaste of honey and peaches produced in the northern Hsinchu and Taoyuan areas. Growers are forced to constantly upgrade and develop. The island’s tea industry peaked in 1973 when it produced 28,000 tons of tea leaves, with 23,000 tons being exported. But since then, the sector has been gradually losing its competitiveness due to labor shortages, rising labor costs and the appreciation of the local currency. The total area of tea farms on the island has dwindled to 15,000 hectares, less than half the size in the post-World War II heyday, as more cheap tea is shipped in from abroad. Chiu Chui-feng, a senior researcher at the state-run Tea Research and Extension Station, shrugged off the threat from cheap imports. “The imports are simply to meet the low-priced demand and have posed no threat to Taiwan’s high-priced tea,” he said. The imported low-cost tea leaves are mostly used in the manufacturing of cheap bottled tea drinks which are popular among young consumers, he said. 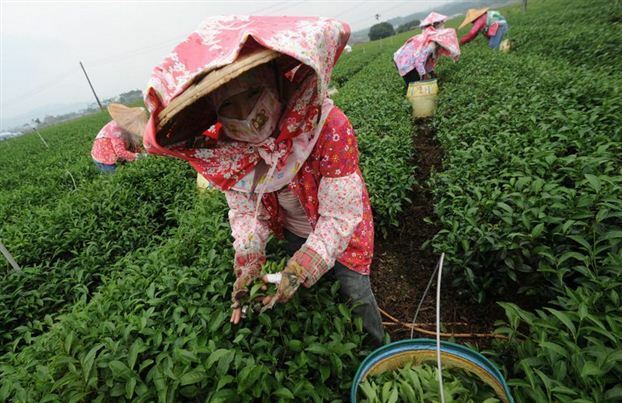 However, experts and tea industry workers are alarmed by the “invasion” of oolong tea grown in Southeast Asia or even in China but packed in Taiwan. “The hard-won credit of Taiwan tea may be eroded by the imported oolong tea sold in the name of Taiwan-grown tea,” said Hsu, the tea trader. While calling on the government to adopt counter-measures to regulate the prevailing malpractices, tea farmers, with the aid of regional associations and local governments, have been pulling all the stops to develop new aromas. Taiwanese tea traders have also worked with farmers to set up overseas tea production in Indonesia, Vietnam, Thailand and China, introducing the Taiwan tea trees and Taiwan-developed manufacturing techniques. But quality comes first, and contests like the one attended by tea farmer Lin are essential in ensuring that the producers keep evolving. This time, however, he did not make it in the stiff race which had drawn a record 5,729 samples of oolong tea leaves harvested in the spring from hundreds of farmers islandwide. “I’ll be back again in the winter tea race,” he said, undeterred, referring to the second of the year’s contests, held in October.